RUNNING COSTS OF £630 A MILE! This car is enough to make any fleet manager or business operator wince. With running costs, including depreciation, currently standing around £630 a mile it potentially is the most expensive car to run in Britain. The 1985 Buckingham is being offered for sale in BCA’s next Classic & Historic sale, at BCA Blackbushe at 12 Noon on Tuesday 2nd October 2007. Costing around £250,000 to build, it has covered just 348 miles in the past 22 years and its value is now estimated around £30,000 – meaning it has cost £632 per mile in depreciation alone! BCA’s Robin Lawton commented “The good news for potential buyers is that the bulk of depreciation has now taken place and there’s every chance this luxurious and unique car will hold its value a little better in years to come.” The car is a true one off, having been commissioned by a wealthy car enthusiast in order to produce a motor vehicle without compromising design or quality. It is understood to have taken eight skilled Aston Martin Lagonda craftsmen some two years to design and three years to construct, with the build cost estimated around £250,000. Using modern technology but with classically inspired coachwork design, the vehicle is based on a high tensile steel chassis with coachwork in hand-formed, double skin aluminium panelling. M/F The ‘gullwing’ rear doors lead to an air-conditioned passenger cabin, finished in Champagne leather with rosewood trim and black leather. 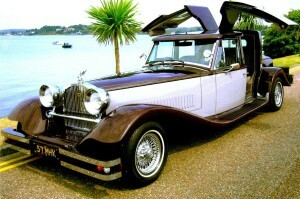 The coachwork is finished in two-tone Burgundy and Champagne and the bonnet sports an unique swan mascot designed by a prominent British artist and produced in solid brass. The radiator badge, produced by Garrards, the royal jeweller, is in gold and black enamel.